Much to Emily's disappointment, I've decided to leave fruit behind for now. There's only so many times I can enthuse about how delicious a slightly different combination of puréed fruit is. I will return to the fruity flavours: there's still at least one product from Rafferty's Farm containing Acai berries that will require careful scrutiny. I've often wondered what this blog would be like if it were a flag referendum. I think the comparison is apt: both are vanity projects, perhaps have their own small followings, but in the end are devoid of point, and met with widespread apathy. That said, I think of all the foods I have reviewed, I think Rafferty's Garden's Apple, Pear and Cinnamon would be Laser Kiwi: widely loved, but a little bit too anti-establishment for the hierarchy to want to take seriously. Only Organic Cauliflower, Broccoli and Cheddar, on the other hand, would be aiming a bit too hard to please, but end up bland, and forced down our throats like a Kyle Lockwood design. And the other Only Organic flavour, the one with Quinoa, would end up as Red Peak, widely loved and shared on social media, but in the end a bit of pompous hot air with a hollow core of nothingness. I guess Wattie's Apple would be the incumbent standard of New Zealand, tried and trusted by generations.Which would leave another Wattie's offering, Green Peas and Courgette, being the flag chosen by Gareth Morgan, a bit of an unoriginal load of unpalatable, self important crap. 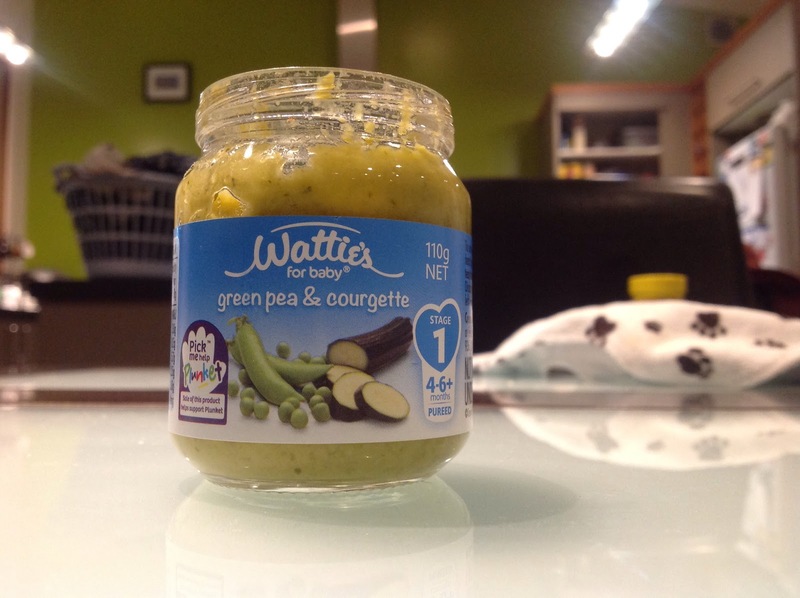 Contains: Peas (39%), Courgettes (37%), Water for cooking, Cornflower. First impressions: Not good. 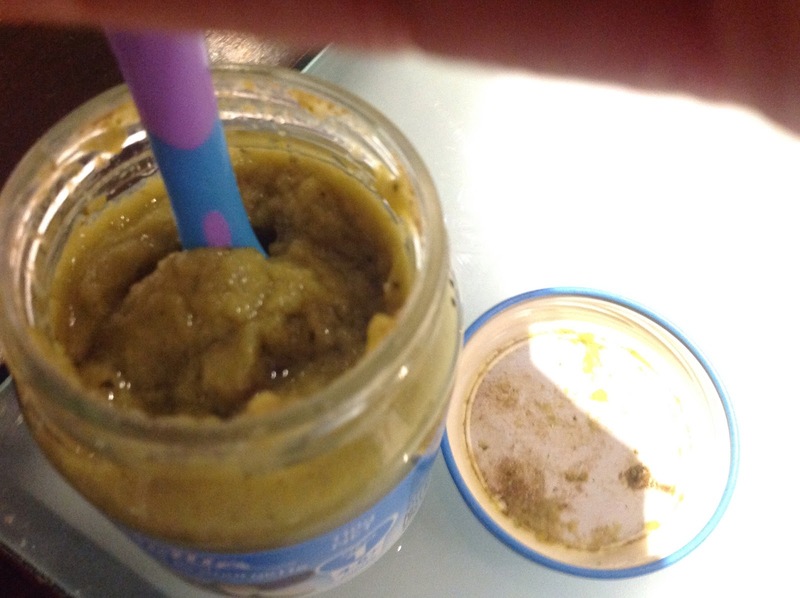 Green is really not a very good colour for a puréed food, especially if you can see sitting water pooling in the surface contours at the top of the jar. I've used a cold sick simile already this week, so I won't use it again. But this looks like something you'd scrape off the wall of your fish tank after neglecting it for a few too many months. Not cool Wattie's. Emily's reaction: From bad to worse. Unfortunately my camera was not close to hand, or I would have one upped yesterday's photo of a disgruntled face. After three spoons, refusal made it look as though the little girl would go to bed hungry. Thankfully, Mummy remembered some left over pear and banana from lunch, and order was restored. Bouquet: Suprisingly, not too bad. A bouquet of freshly shelled peas hit a not unwelcoming nose, with the sweet follow up of a hint of courgette. After the initially unpleasant sight of this product, I felt as though I could happily settle down to taste it. Taste: a most unpleasant sensation in the mouth. Unlike the hitherto smooth concoctions I had tasted, this was more a messy mush. Peas once again dominated on the palate, with only a hint of the zucchini at the back of he tongue. Surprisingly for something added only to assist in the cooking process, the water was actually the second most prominent ingredient. The taste lingered unwelcomed in the mouth, not unlike an overstaying party guest, and only a hearty draught of water would rid of it. As per Wattie's serving suggestions, I gamely decided to try this food warmed up. 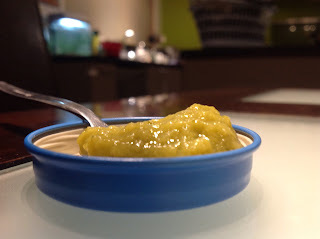 Even worse: after thirty seconds in the microwave, a warm, sticky green paste presented itself, adhering to the sides of the mouth. Maybe this is an acquired taste and texture: after thirty two years, however, I am no closer to acquiring it. Overall: 3/10. The fresh green pea taste itself was not unpleasant, but the texture, and over prominence of water made this a disappointing and poorly tolerated dinner. Enjoy with: Not much. Maybe if you're truly English and in to that sort of thing, a plate of soggy fish and chips.